From the beautiful city of Seville this cycling adventure takes us across a well-kept Spanish secret - the vast and beautiful open landscapes along Europe's oldest border between Spain and Portugal. Along the way we see the legacy of Roman Iberia, the Moors and the land of the conquistadores in Extremadura. 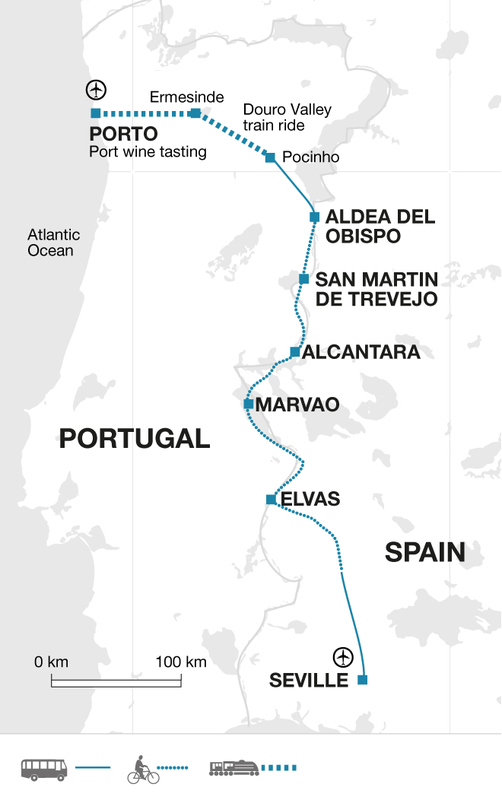 Finally we travel by train along the Douro Valley into Porto where we celebrate the end of our journey with a glass of port. Our trip starts in Seville, the capital of Andalucia and a city which overflows with life and variety. It has a popular quarter in Triana and a high-born area in Santa Cruz. Ramparts dating back to the 13th century, the Alcázar and the Giralda, all remind us of earlier Moorish occupation and later buildings reflect the Mudejar architectural style, a mixture of Moorish and Christian styles. In the early evening we plan an orientation walking tour around the city. Seville is a fascinating city with many attractions so we recommend booking some extra time before the tour starts. If you have any free time we suggest a visit to the Alcázar, a wonderful Moorish and Mudejar royal palace, and the impressive Cathedral with its imposing Giralda tower - originally a 13th century minaret. We start this morning with a two hour drive to visit the fascinating medieval town of Jerez de los Caballeros, located in the province of Extremadura. The old town is surrounded by a Moorish wall with six gates. Its staple trade is in agricultural produce, especially in ham and bacon from herds of pigs which are reared in the surrounding oak forests. Afterwards it is 1 hour drive to the start point of today's cycle ride at Cheles in Spain. On our bikes for the first time we make our way through a landscape of cork oak estates and farms to the Portuguese border town of Elvas. A well-preserved ancient settlement, still partially enclosed by medieval walls, Elvas has UNESCO World Heritage Status and is home to a Roman temple and aqueduct from a much later period. The middle section of today's ride will test your fitness with two short climbs. We finish our cycle route with a final climb to our accommodation right in front of the Amoreira aqueduct. Our total cycling distance today is approximately 55 kilometres (750 metres total accumulated ascent and 600 m descent). Today we set off by bike directly from our accommodation and our route is mostly on very good tarmac roads and across a rolling landscape. Criss-crossing the Spanish-Portuguese border we cycle through some lovely Alentejo scenery to Marvao, a dramatic medieval hilltop village. The narrow cobbled streets are lined with whitewashed houses, some dating back as far as the 15th century, featuring characteristic terracotta roofs and decorative wooden doors and windows. The houses wind their way up along a steep ridge to one of the best preserved castles in Portugal, dating from the 13th century. We recommend a visit to the castle in your free time where the views are superb, giving a panoramic vista far over the wild rocky landscape towards Spain and the Serra da Estrela Mountains in Portugal. Today is the most challenging ride (and possibly the most rewarding!) with some hills along the way. The final 5km has an average gradient of 5% and there are a couple of steep climbs to end the day. Our total cycling distance today is approximately 87 kilometres (total accumulated ascent 1400 metres, total accumulated descent 950 metres). After breakfast we have a scenic and undulating ride across a high plateau enjoying wide-open spaces on our way to our final destination at Alcántara (derived from the Arabic word for 'the bridge'). Alcántara is famous locally for its six-arched Roman stone bridge built across the Tajo River. The border is locally known as 'la raya' (the line) and the condition of the roads on our ride tend to be slightly better on the Spanish side. The town is also home to a hydroelectric dam and reservoir, surrounded by pretty holm oak and cork oak forests. Alcántara lost all its importance in the 19th century, when the religious order's properties were secularized. Its depopulation was halted only in the 1960s, when the dam and electricity plants were built. However, its economy was not boosted, and the town is still part of one of the less developed areas of Spain. Our total cycling distance today is approximately 82 kilometres (total accumulated ascent 850 metres, total accumulated descent 1500 metres). Departing from Alcántara we start the day with a warm up climb and then continue to ride along the edge of the Extremadura region of Spain, an area dotted with big finca estates and farmland. In the second half of the day we encounter more hills as our cycle route leads us up into the Sierra de Gata Mountains. The ride culminates with a demanding ascent to reach our night stop in the town of San Martin de Trevejo, still in Spain and located in a beautiful valley setting between mountains against a backdrop of olive groves and oak woodland. Our total cycling distance today is approximately 77 kilometres (total accumulated ascent 1200 metres, total accumulated descent 950 metres). Today we have a slightly more challenging ride as we pass through the Sierra de Gata Mountains, offering us excellent views as we follow the border northwards into the Spanish province of Salamanca. We start the day with a long and steep climb (9km with an average gradient of 5%). The very particular isolation of Sierra de Gata has contributed to conserve two linguistic fossils - Fala and Extremeño - and this mountainous area has remained one of the most untouched and natural areas on the Iberian peninsula. The area is also known for wild mushrooms and many locals are aficionados; heading off into the forests in season, basket in hand. Our cycling involves some harder climbs today, but there are lots of places to rest and enjoy the scenery and we will be rewarded with exhilarating downhills as we go. Tonight we will stay in a lovely hotel in the village of Aldea del Obispo in Spain. Our total cycling distance today is approximately 75 kilometres (total accumulated ascent 1000 metres, total accumulated descent 800 metres). We start this morning with an early 2 hour bus transfer across the Portuguese border to Pocinhos. From here we take a three and a half hour train ride on a winding route amid lovely scenery along the Douro Valley past countless vineyards all the way into Porto, arriving mid-afternoon. After a short walk to our hotel we check in. After a short orientation tour on foot, we visit the Sandeman wine cellars where we enjoy a port wine tasting. This evening we celebrate the end of our journey in this lovely city with a final group meal. Our trip ends this morning in Porto after breakfast. When cycling: quick drying cycle tops, padded cycle shorts, lightweight wind and water proof jacket and warmer breathable layers where local conditions require. Be prepared for some colder days on the bike on departures in April, May and October. General: Pack essentially for mild or hot weather depending on the time of the year. Portugal: Visas are not required by UK, Australian, New Zealand, US and Canadian citizens. 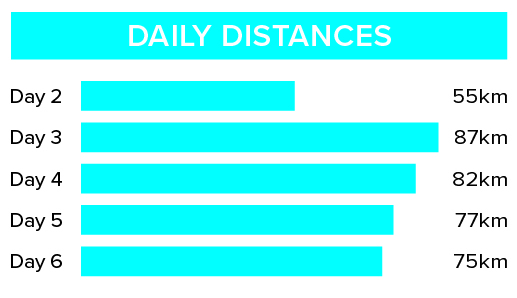 On this tour we cycle 376 km over five days (an average of 75 km per day). We generally cycle on quiet tarmac roads and most of the rides are through hilly terrain. The steepest and most challenging climbs are on days 3 and 6. Each day a support vehicle carries the luggage from point to point, accompanying the ride wherever necessary while the Leader cycles with the group. We have graded the route as moderate to challenging.